Pre-heat the oven to 180 degrees celsius. Roughly chop the aubergine, tomatoes, peppers and onion, then add them to a large roasting dish, add in the whole garlic cloves, drizzle on the olive oil and sprinkle on the dried herbs. Toss everything well then place it in the oven for 35 minutes. In the meantime, cook the spaghetti in salted, boiling water and drain it off then set aside. In the same pan, add in the spinach and leave it to wilt down, then remove the roasted vegetables from the oven and transfer it over to a food blender. Add in the sun-dried tomatoes, nutritional yeast, chilli flakes and season it with salt and black pepper, then pulse it until it forms a chunky-sauce, but not so much so that it turns into soup. Add the pasta sauce straight to the pan with the wilted spinach, stir and warm it gently for a few minutes before adding the cooked spaghetti back in. Turn the pasta through the sauce and spinach, then squeeze in the juice of half a lemon. 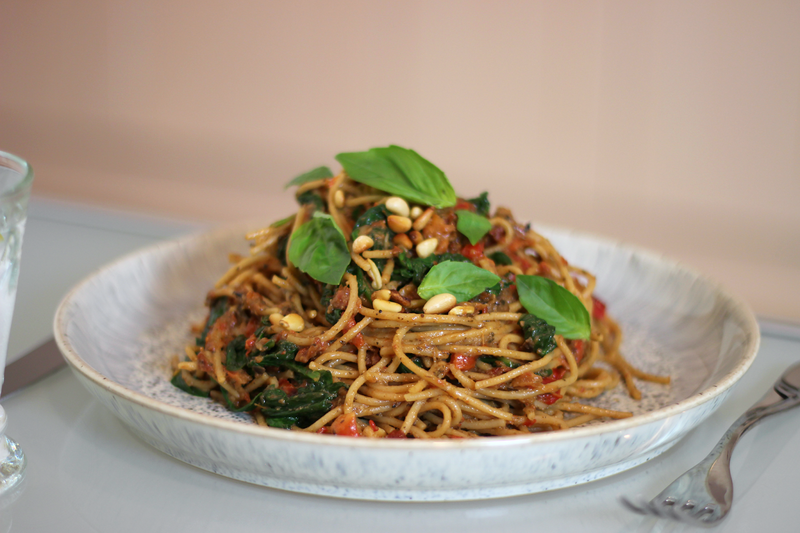 Turn again, then serve immediately and garnish with the toasted pine nuts and fresh basil leaves. The pasta sauce can double-batched, simply add in twice the amount of each ingredient. Freeze it in a container and use within 2 weeks for maximum freshness - simply defrost, warm it up and add it to your cooked pasta. Just tried out this recipe and had to come to thank for creating this. It was absolutely delicious!